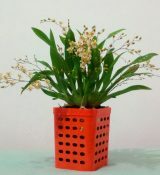 Fertilizing, watering, and temperature control play a major part in the successful reblooming of your orchid. Learn more about how you can encourage your plant to flower. Blue & Black Orchids: Do They Really Exist?